Booking is recommended, particularly at weekends and for larger parties. 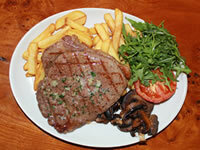 All food is cooked fresh on site and to order, therefore during busy periods there may be a delay. If you are on a time schedule please ask for waiting times so we can accommodate you as best we can. Fish is delivered fresh and filleted on site so may contain small bones. Please speak to our staff prior to ordering if you have any allergies or questions about our menu. We are always happy to accommodate your requirements wherever possible.